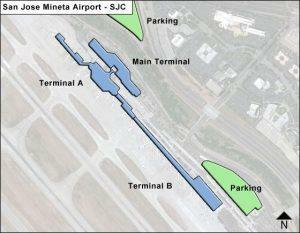 Norman Y. Mineta San Jose International Airport Parking Your car can pay for your parking space. Norman Y. Mineta San Jose International Airport Parking : TravelCar’s sweet parking deals are now available at Norman Y. Mineta San Jose International Airport. Make parking an exciting affair; away from the usual boring and tiring activity it has always been. Riding and parking at the airport usually are tedious and draining activities. We are here to help make your life easier at the airport and in areas surrounding the airport. We have a variety of services to offer. For a small price, you get a nice parking slot offsite. Also, you may request for an oil change, a car wash, interior and exterior car detailing, and brake servicing. As mentioned previously, we are located in other regions surrounding the airport. We offer parking spaces and car rental services. We are in the San Jose City, other nearby downtowns, train stations in California, hotels close to SJC and seaports in California. Contact us for any clarification on our websites. Our office phone number is +1 888-807-0209. Norman Y. Mineta San Jose International Airport (SJC) is a public airport in the Northwest direction from the City of San Jose, Santa Clara County, State of California. SJC is three miles away from San Jose Downtown, Santa Clara County in the State of California. SJC covers 1,050 acres of land. It has two runways, and two passenger terminals, Terminal A and Terminal B. Terminal A handles International Arrivals. 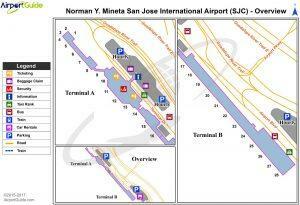 Norman Y. Mineta San Jose International Airport is part of the three airports serving the San Francisco Bay Area. The other two airports are San Francisco International Airport and Oakland International Airport. The U.S.A based airport is the fifth busiest in passenger enplanements in the State of California and the 40th airport countrywide. SJC facilitated 155,914 aircraft operations and 12,480,232 passenger enplanements. Lot 3 provides for hourly parking options. Curbside parking is restricted at SJC. TravelCar should be the number one company on your list when you think of parking at any given airport in the United States. We have extremely sweet parking deals that will leave you drooling. We have a strong network of professionals working both online and, on the ground, to ensure your parking dreams come true. You can depend on us to secure a parking space for you. It helps in avoiding a fruitless search of a parking spot when you drive into Norman Y. Mineta San Jose International Airport. It is wise for a traveler to shop around for the best parking deals prior to a visit to the airport. It gets even more critical when it comes to a big city like San Jose where traffic is crazy to and from the airport. You may be driving to the airport to pick a passenger to drop a passenger. In that case, you may want quick parking as you wait for a client. On-site parking is never a guarantee because you cannot predict the number of drivers seeking parking at a particular time. Therefore, you can park offsite as you await your client. You can pick them at the curbside when they are ready to go. Our parking spaces are secure and located offsite. Cheap as it may seem, the spaces are neat and come with extra facilities such as car wash. You may also give further instructions on car detailing. Pocket-friendly pricing allows you to save some much-needed coins. Book a parking space now on www.travelcar.com. Please, do not be left behind on these sweet parking deals. A frequent traveler may need to enroll in parking services at TravelCar, the reason; you get great discounts on parking. You also enjoy valet parking and assistance at the curbside. Valet parking makes the whole deal sweeter than other parking options out there. You get time to clear through security if taking a flight. Our valet team is conscious of time in parking and retrieving your vehicle when you need it back. They are also masters in stack-packing. San Jose is a large city and attracts huge traffic. You are likely to have a hard time getting a suitable parking space within the airport premises. Get a valet to park your vehicle offsite where it will stay safe. Kindly note that valet parking services are accessible 24/7. These sweet parking deals are only available at TravelCar. TravelCar is committed to serving its clientele base by providing sweet parking deals that are irresistible. We believe in giving our clients great value for their money. Professionalism is not about a product but also how a service is rendered. We are a communicative transport agency. We have customer service officials determined to answer all your questions regarding TravelCar, our services, our locations, and the booking process. Customer support is available 24/7. You can reach us via phone, Facebook, Twitter, LinkedIn, Google Plus and our official website. Connect with us today and grab sweet parking deals to make your journey worthwhile. Road Acerail It is accessible at Santa Clara Caltrain Station. Airport Information Booth, restrooms, pet relief areas, bars & restaurants, Wi-Fi, paging stations, massage chairs, optic wash kiosks, nursing suites, wheelchair services, luggage carts, ATMs, IPal Playground, bicycle racks, Airport Public Art Program Audio Tour, Blue Dot- Meeter/Greeter Area, and Automated External Defibrillators (AED).